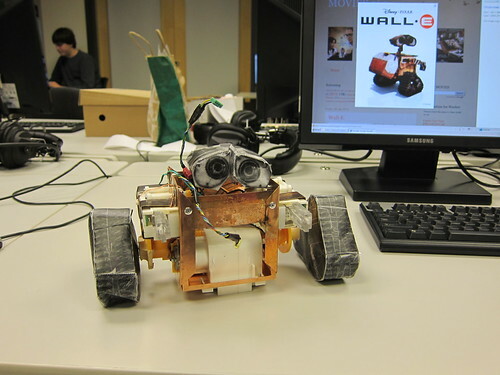 Several months ago, a teacher at Seattle’s Bush School, Marilyn, was looking for someone to help teach an Arduino based class to make little robots. Her son had taken a similar class and had a great time; she wanted to bring that experience to more high school students at her school. She Googled for Arduino and Seattle, and the first relevant link was to Metrix’s site. She emailed Matt, the owner, to ask if anyone had experience teaching and wanted to help bring her idea to life. The Bush School is a little different from most. They have opportunities for students to take non-traditional classes, which offer experiential learning and project based courses. The robotics class was one of these special, elective programs. Aimee, employee extraordinaire, was very much interested, and worked with Marilyn and Morgan, Arduino expert, to come up with a class schedule. 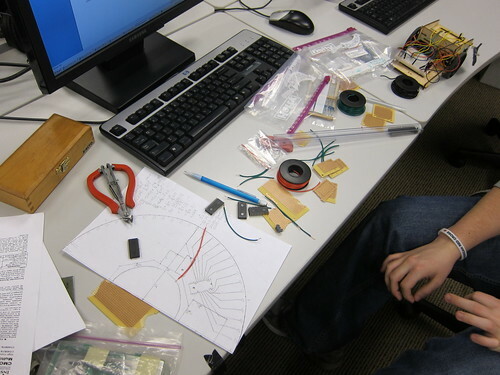 It was a 10 week long course (one two hour class per week), and by the end of it, almost every student in the class had built their own really neat robots. The first two weeks were lecture. 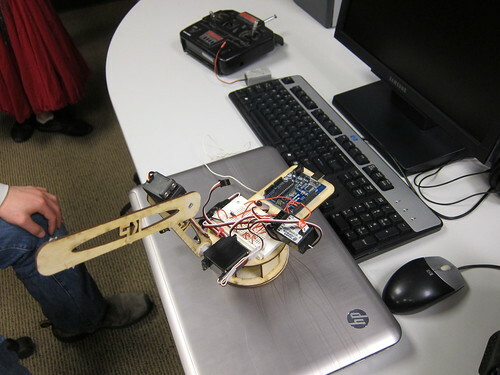 An introduction and explanation of Arduino and robotics. The next two were for robot building. Every student was given the same plans for the robot, and they had a contest at the end to see how well their robots were built. After that came the Inkscape class that I was lucky to teach, and then finally five more weeks of working on their own robot they came up with individually. Aimee told me that it was somewhat difficult to fit everything in such a short amount of teaching time, as the students had to learn about electronics, design, and of course configuring hardware and software on the Arduino. However, the students were very attentive and great learners, and really got a lot out of the course. The final projects were amazing. One student built a robotic arm, one made a robot that could recognize objects and then drive to it, one created an interactive desk cube. One student built a web server! 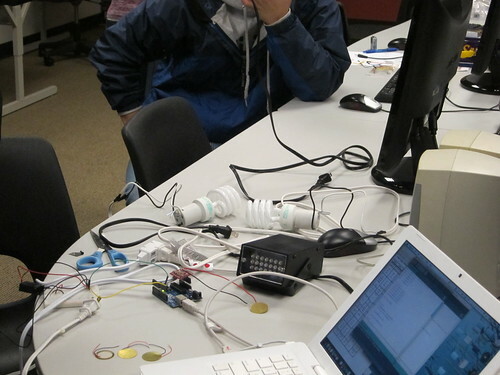 Yes, an Arduino web server (he could control LEDs remotely through his web browser!). One made an interactive drum kit that controls strobe lights when you hit the drums, one made a reactive distance sensing robot that would move away when you got too close, and another student was in the process of building a clock with LEDs at the minute and hour marks. These were just some of the final projects. I asked Aimee, Morgan (who taught one class), and Lisa (who helped out at a couple of classes) what it felt like to help these students learn and succeed. They all told me they would love to do it again. They were impressed with the students coming so far in such a short amount of time. Aimee told me that she was especially happy when one of the students, who hadn’t been able to finish his final project by the end of the class, came to her and told her, “I figured out why it wasn’t working”. 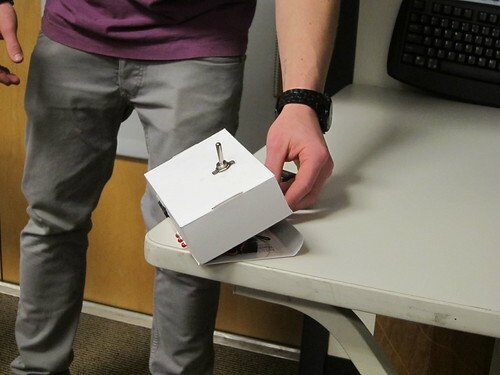 He came in not knowing how to program at all, and he had gotten to a point where he could read through the code well enough to know why it wouldn’t work. The whole point of the project, she told me, was to get students to this point. The students learned that they could do it. She thinks it’s important to teach about engineering and science and how to interact with technology in our world. It’s very rewarding to see the impact on helping a student understand and get interested. If you are interested in having a Metrix taught class at a school or similar institution, please contact Metrix.